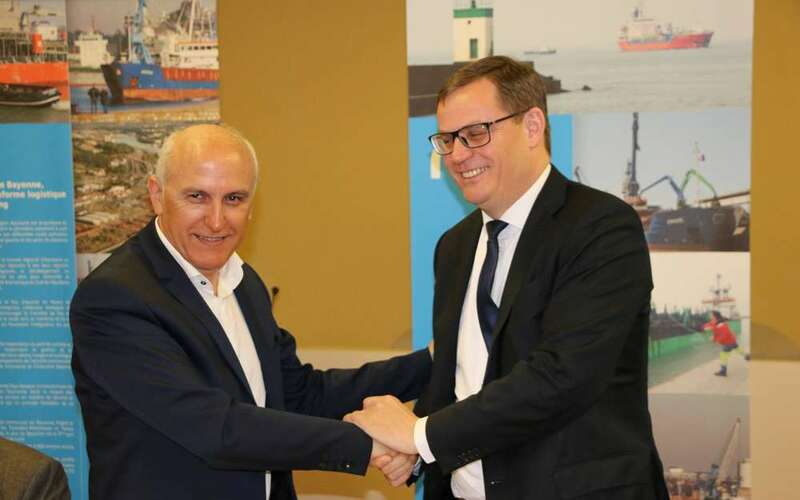 The Chamber of Commerce and Industry Baiona-Pais Vasco, concessionary of the commercial port of Bayonne, recently signed a contract for two Liebherr mobile harbour cranes LPS 550 and LPS 420. The first one, which will be used in the Tarnos Terminal, has a boom outreach of 48m. Its lifting capacity is up to 50t in a 40m boom configuration, and 124t with a 20m radius. The LPS 420, aimed at working on the Blancpignon Terminal, has also a 48m maximum outreach. When its unfolded to 40 and 20m, the boom can respectively lift up to 28 and 60t. Both cranes will work for bulk handling, “ easing the container traffic activities and ensuring the continuous service in related terminals “, as stated the CCI. The contract worth up to nine million euros. Both cranes will be delivered in Spring 2019. Photo (from left to right) : André Garreta, CCI Bayonne CEO and Leopold Berthold, Liebherr Managing Director.